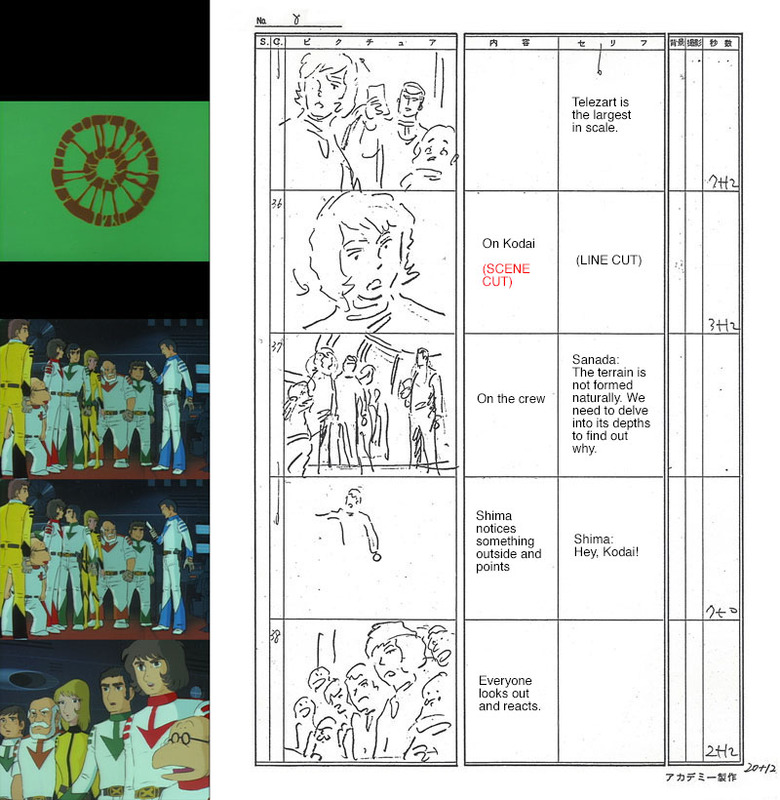 Opportunities to examine how anime is made are not as rare as they used to be, but back in the late 70s they were very rare indeed. 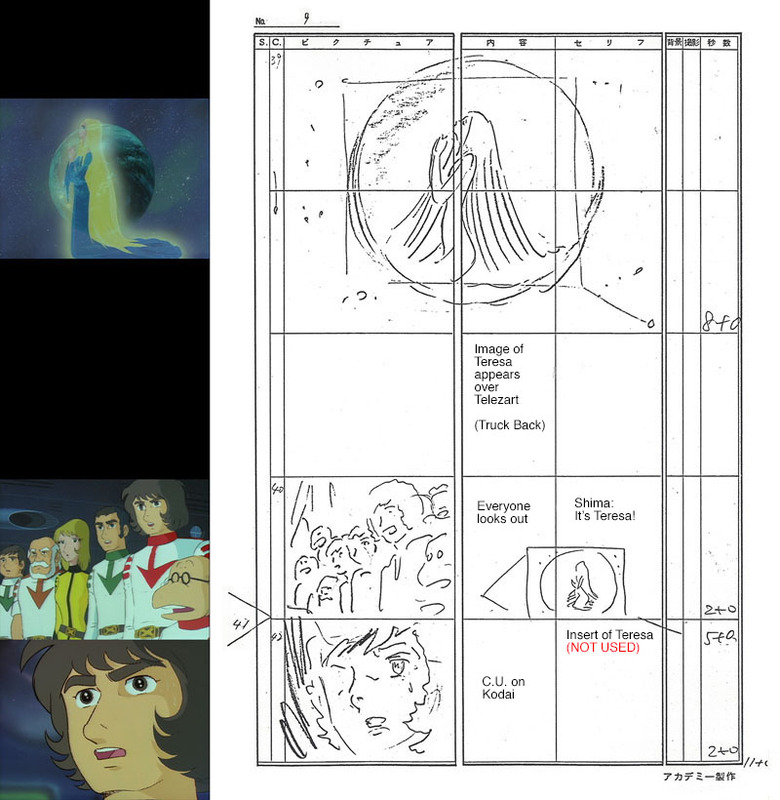 One of the things that made Space Battleship Yamato unique in that area was a fan base so dedicated that they would ferret their way into the studios where it was made and score copies of production materials to share in fanzines. 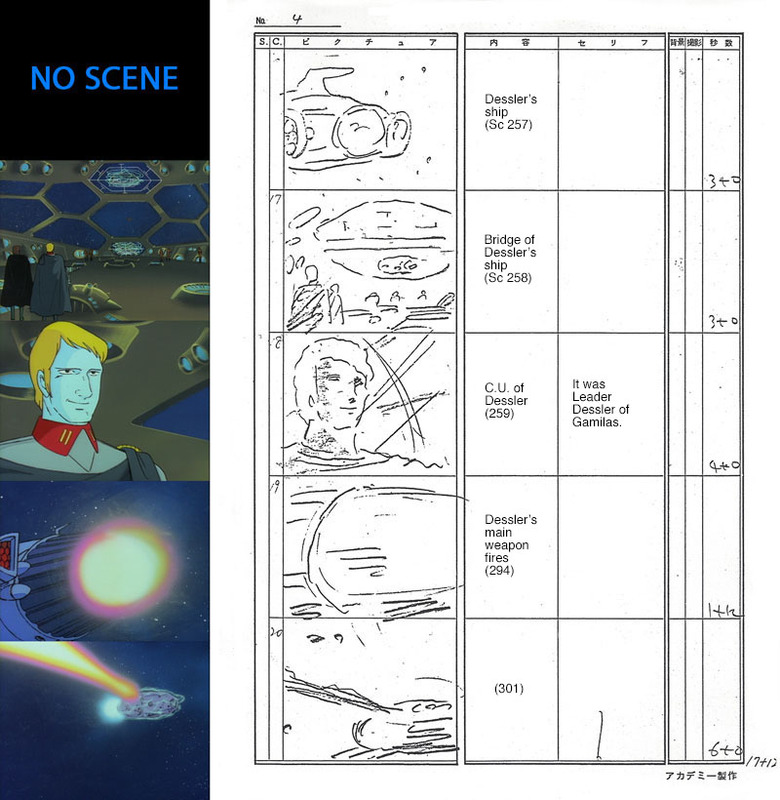 It is thanks to them that a presentation like this one is now possible: a complete scene-by-scene examination of a single TV episode. 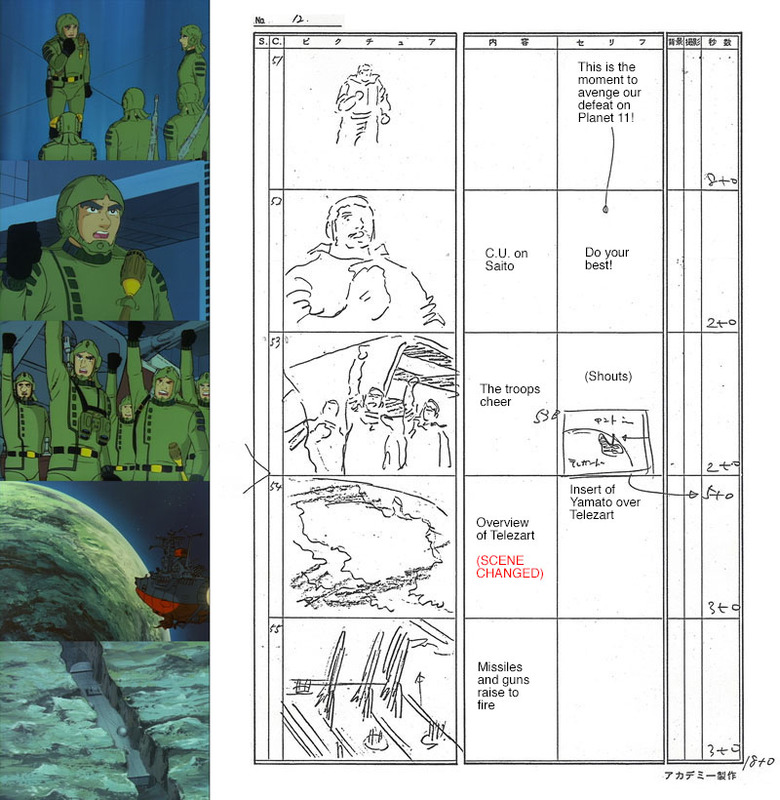 To understand what we’re seeing here, it’s necessary to describe part of the production process. 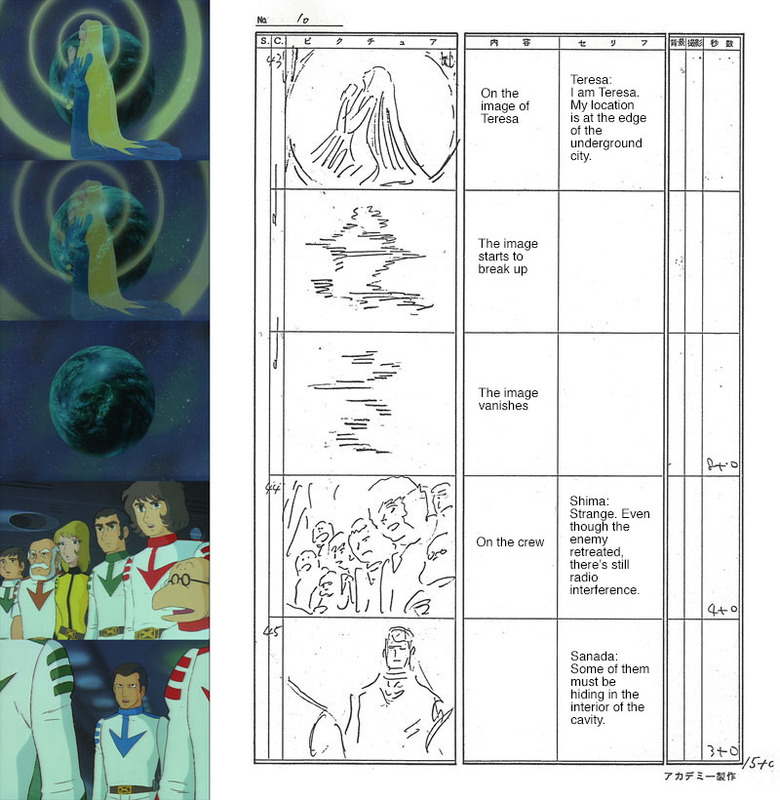 To produce multiple episodes simultaneously (since one had to be delivered every week), the task of animating them was shared by several subcontractors. 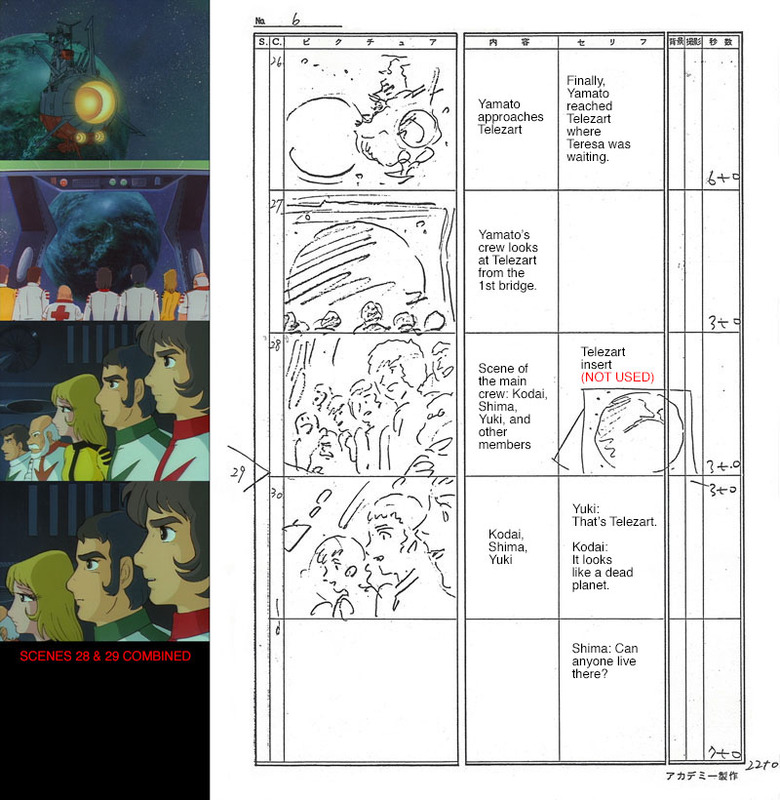 In this case, the subcontractor was a studio called Anime Room, supervised by Art Director Takeshi Shirato. 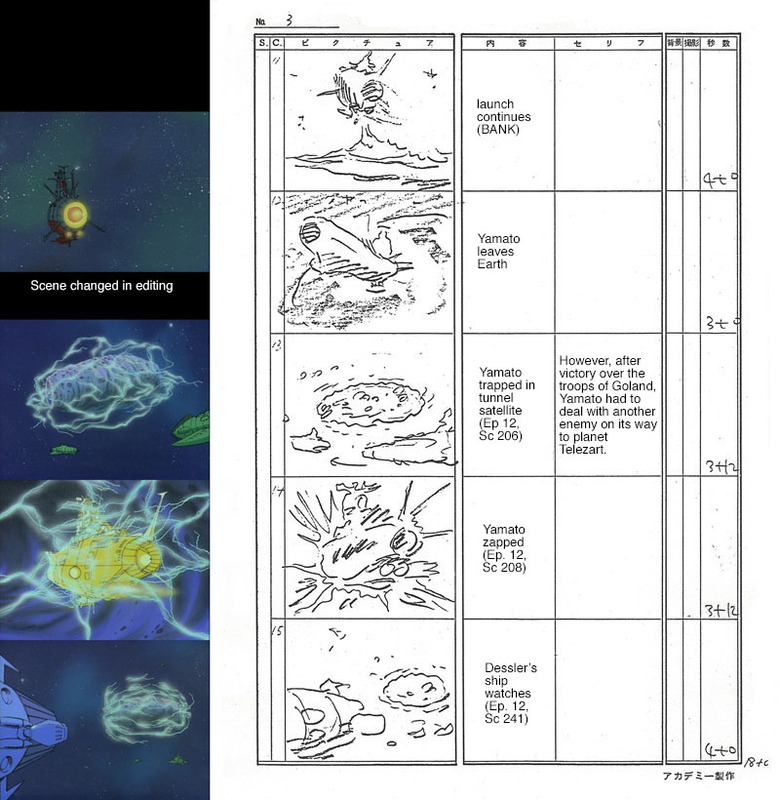 The script for Episode 13 was written by Shunsuke Tatei and turned over to Storyboard Artist Shoji Okuda. 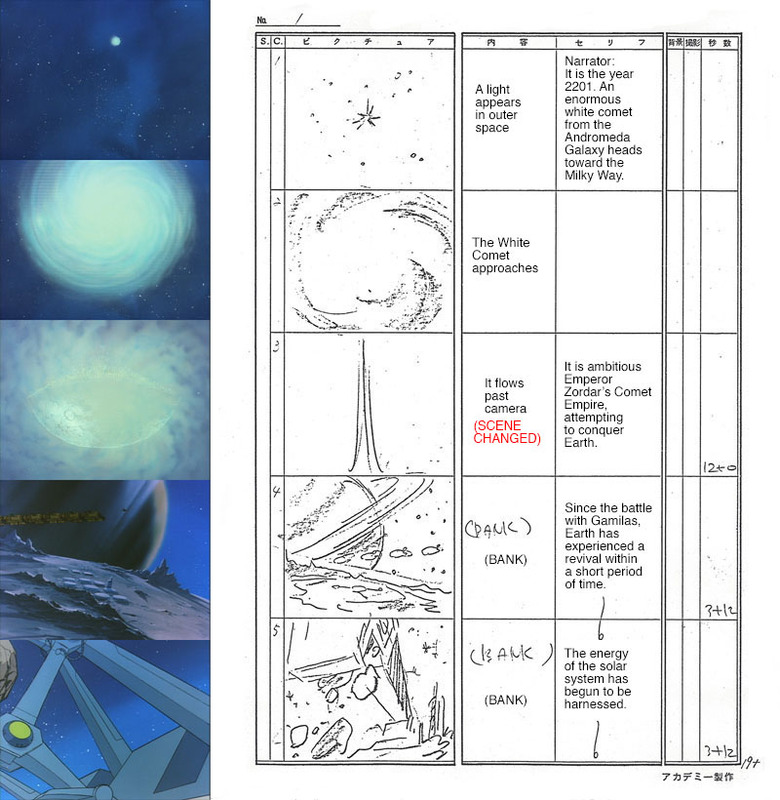 His job was to transform the words into pictures that could then serve as the foundation for everything that followed. 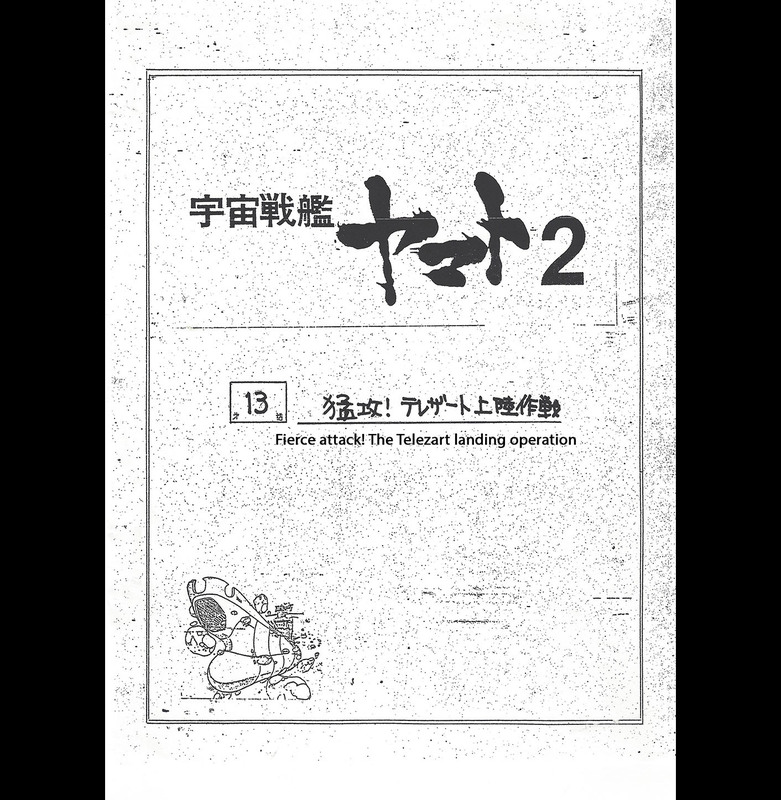 Series Director Noboru Ishiguro revised and approved it, and Shirato’s team took it from there. 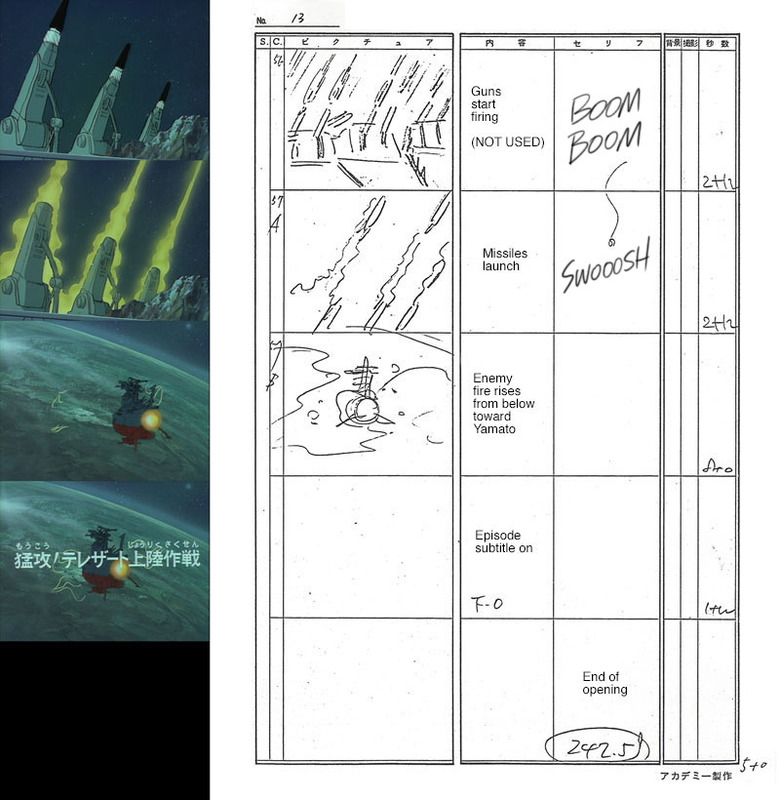 What we’re seeing here is the storyboard for Cut 26 (Yamato approaching Telezart) which was estimated to run for 6 feet of film (a total of 96 frames, or 4 seconds of screen time). 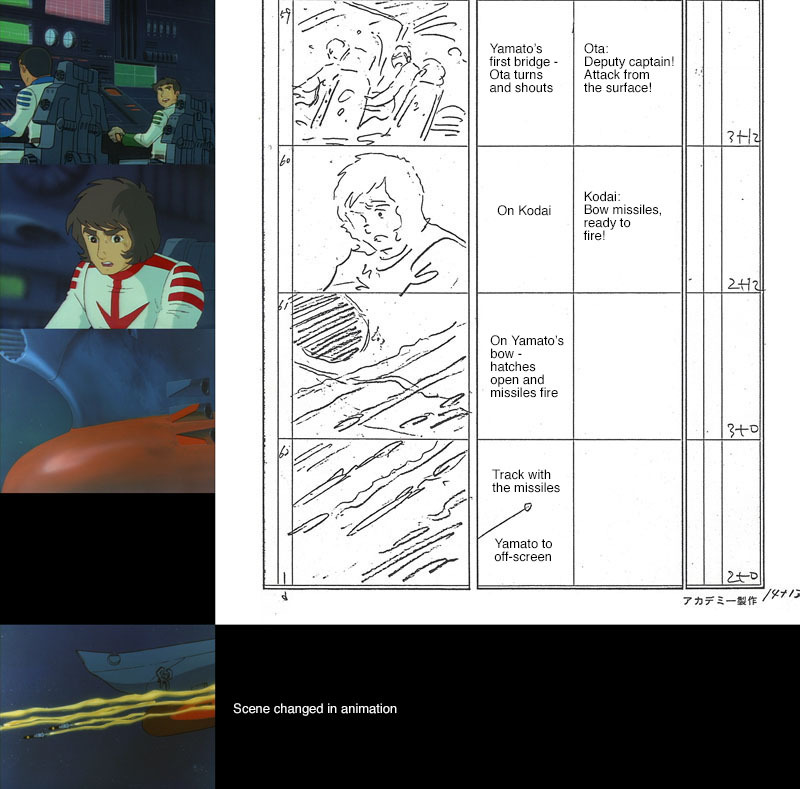 Throughout this presentation, you will see finished stills next to their corresponding storyboard with translated descriptions and dialogue. 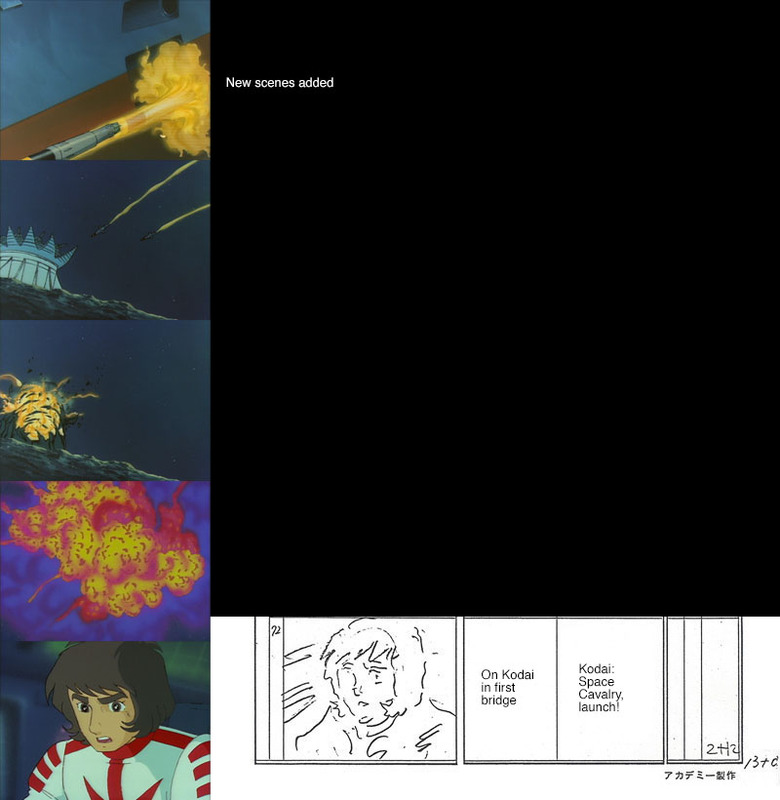 However, the storyboard was only a first draft. 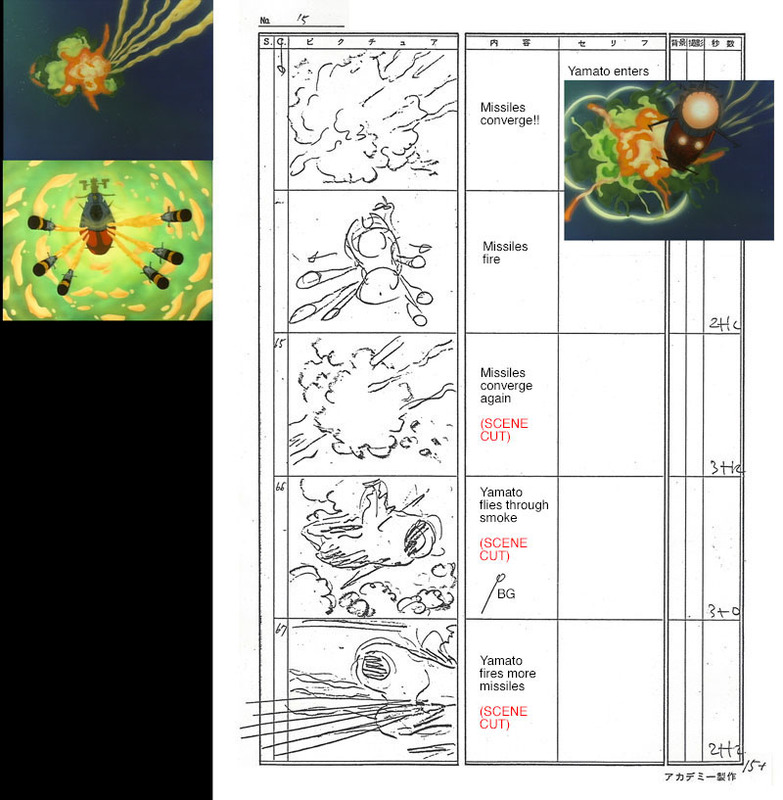 The director revised it, layout artists refined it, and animators added flavor. 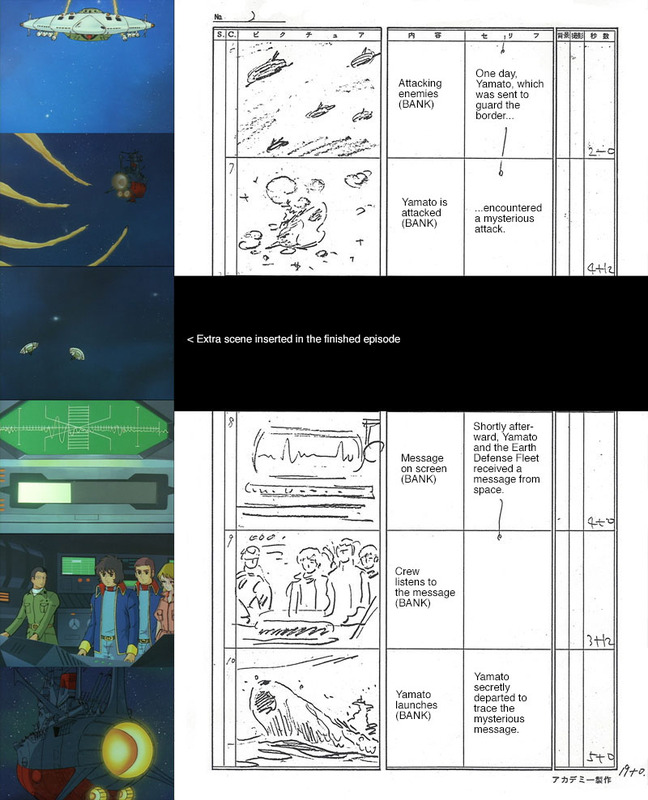 Thus, not every nuance of the finished episode is captured in the stills; simply enough to appreciate how the episode evolved from one phase to the next. 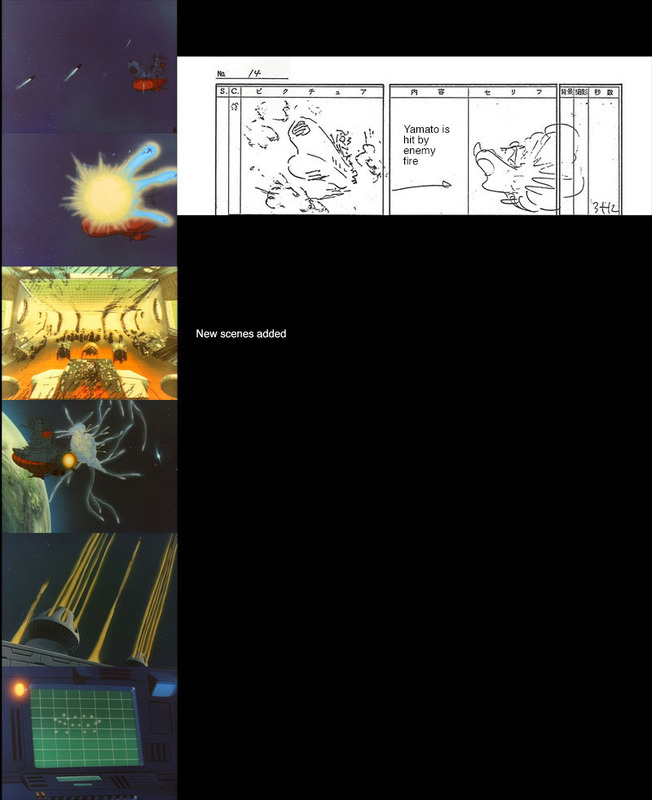 Finally, there is some jargon to be aware of. 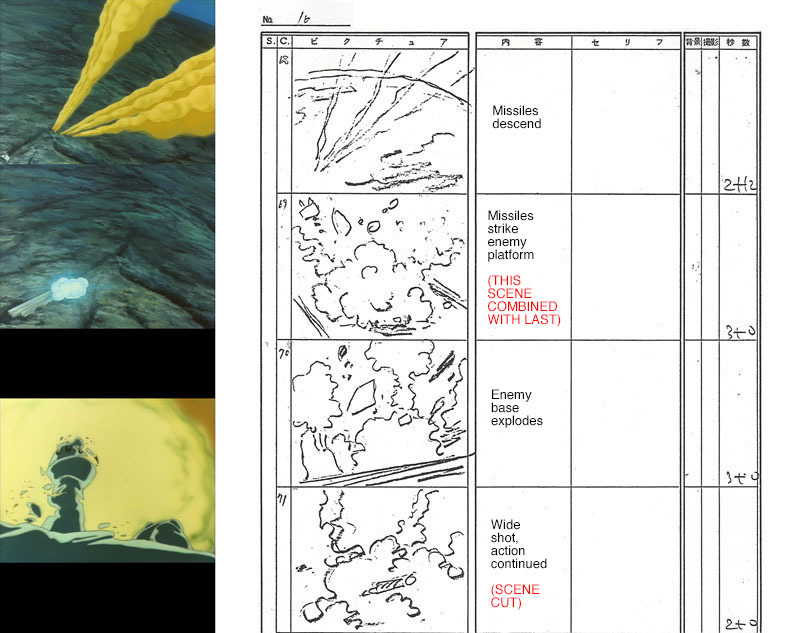 “Cut” is synonymous with “scene,” but since western filmmakers use that term for an edit, we’ll stick with the word “scene” here. 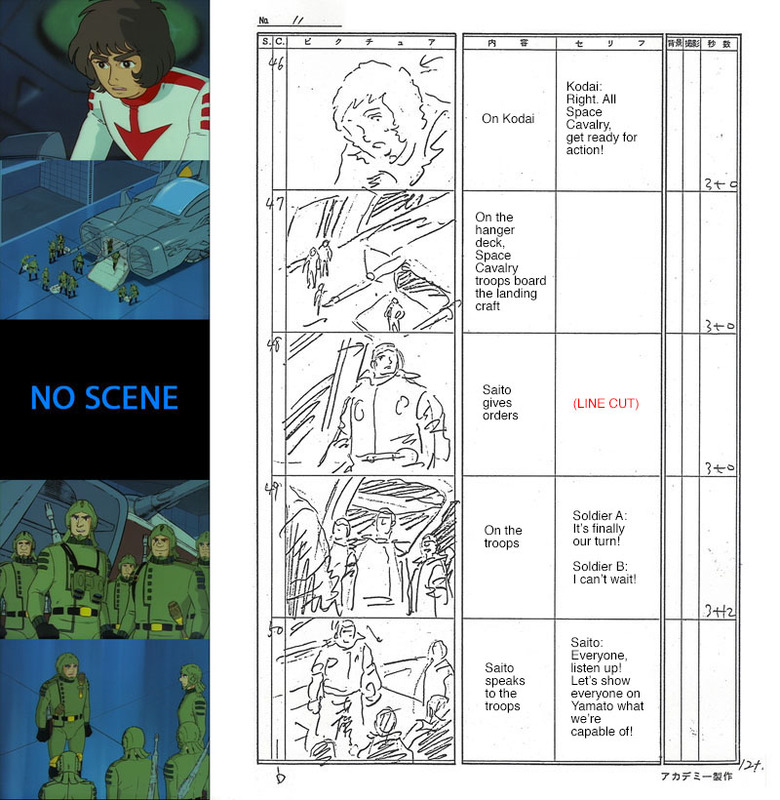 “Truck up” and “truck back” are the equivalents of “zoom in” and “zoom out.” “Bank” indicates a stock scene that already exists (some of these came from Farewell to Yamato while others came from previous Yamato 2 episodes). 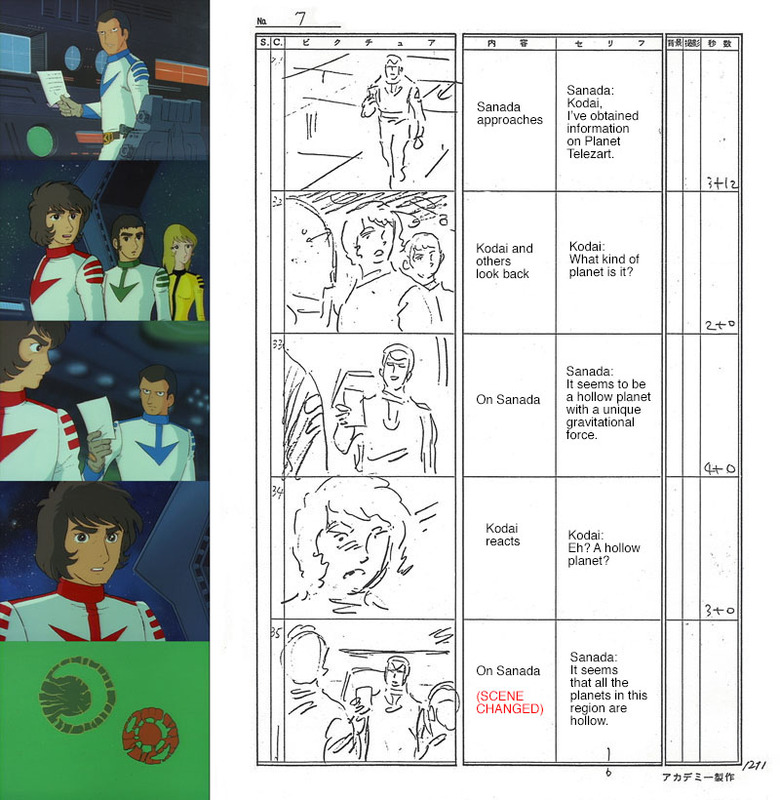 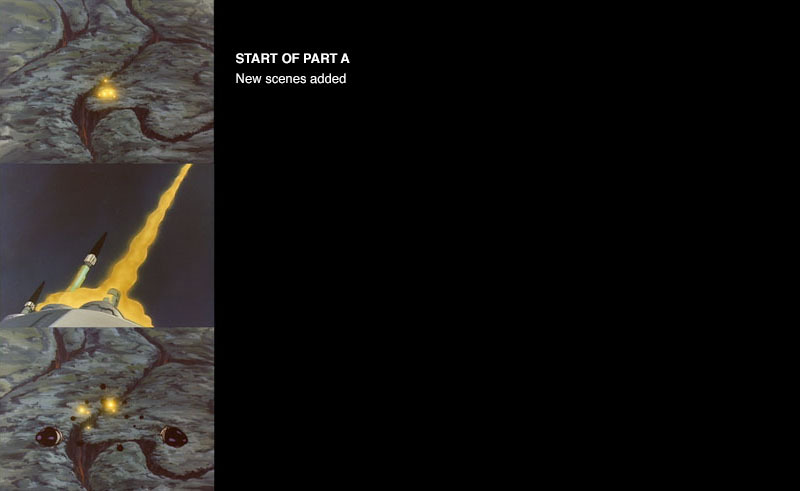 Red text is used to point out a change from the storyboard to the finished footage. 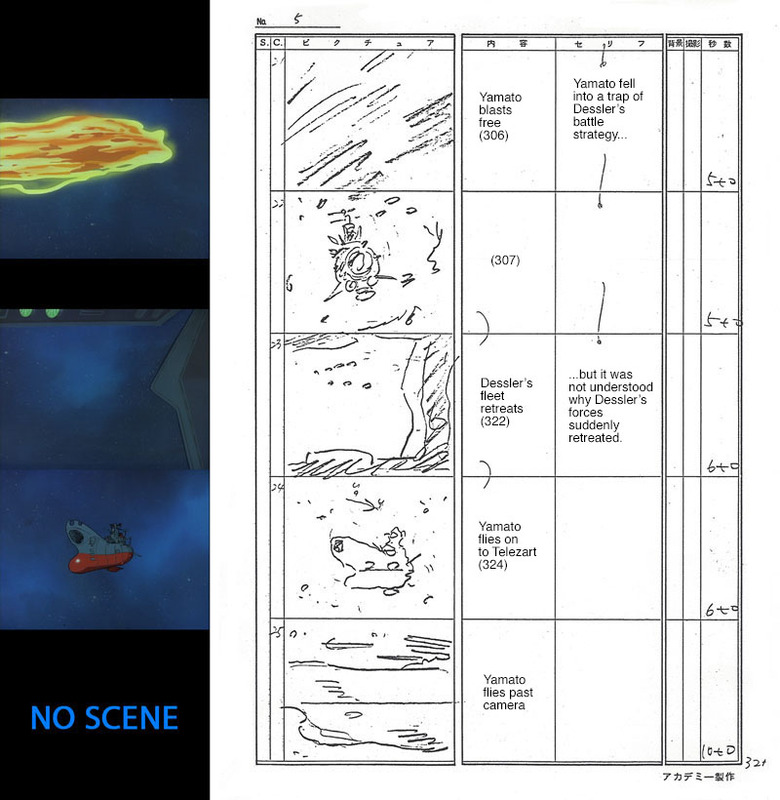 With that, let’s deep-dive into Episode 13 and see it in a whole new way.